The floors in the gallery of the main entrance were sanded and stained and new flat stock moldings were added. The custom light fixture is by JGood Design. Photographs by David Anderson. Real estate agents see a lot of Manhattan apartments that have fantastic river or city views on the outside, but leave much to be desired on the inside. 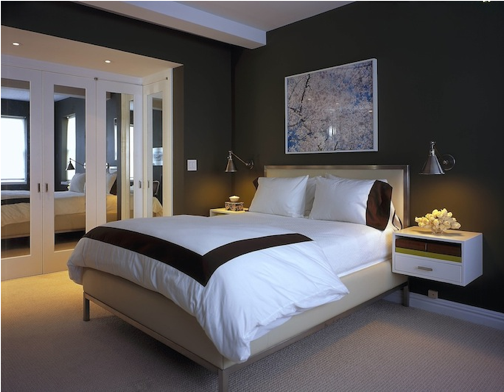 Such was the case with this apartment before David Katz of Katz Architecture refreshed it with a mix of modern and classical influences. Katz started by modifying the entry and walls around the dining room to create a formal gallery and an open-plan kitchen that worked for the young owners, who love open spaces and light and regularly host formal gatherings but also have a busy day-to-day family life. 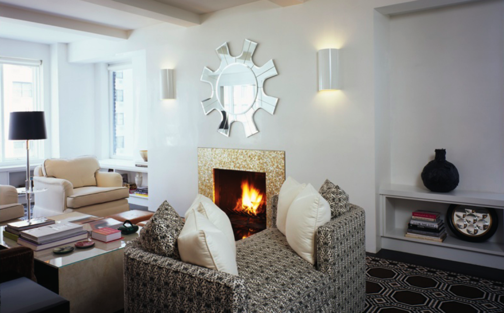 He also brightened the living room with a new mother-of-pearl fireplace surround and finished the walls with Venetian plaster. Finally he added tons of built-in storage and bookcases, making the space as functional as it is beautiful. With a chic interior design by Laura Yaggy Harris of Lorely Design, this apartment now has it all—inside and out. The renovated living room includes Venetian plaster on the walls and a new fireplace surround by VersaTile. New millwork adds storage and conceals the radiators. The completely renovated kitchen features custom rift-cut white oak cabinets and Calacatta Gold marble counters. 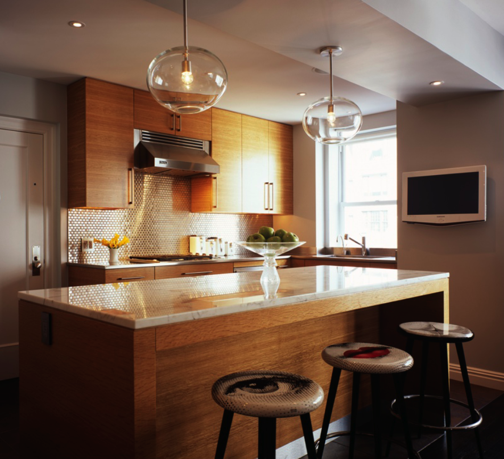 Custom light fixtures by JGood and tile by Ann Sacks enrich the space. 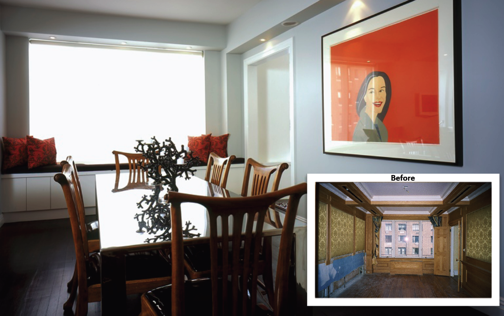 The wallpaper, molding, and paneling in the dining room were replaced with modern millwork for a cleaner profile. Custom doors with inlaid antique mirror enhance the closets in the bedroom. Custom wall-mounted night stands add more storage with a clean finish.